It’s not just negotiators involved in discussions during the landmark climate change talks currently taking place in Paris. Side events and exhibits are an important platform to explore how to collectively meet the climate challenge. 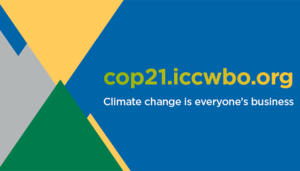 Here are the four side events ICC is hosting during COP21 to generate discussion on some of the major issues in the United Nation’s climate process. With a remarkable ability to turn challenges into opportunities, the private sector is already taking the lead in delivering and deploying powerful solutions to meet the climate challenge. The many ways stakeholders can collaborate to bolster climate resilience will be the focus of this side event, taking place on Friday 4 December in the UNFCCC Blue Zone. Featuring business representatives from Swiss Re and S&P, and moderated by Bilfinger’s Kersten-Karl Barth who chairs the ICC Commission on Environment and Energy, this ICC event, in partnership with Comite21, will put innovation centre stage and showcase existing successful adaptation solutions. What better setting than the Grand Palais in central Paris for our event to highlight the countless possibilities for cross stakeholder collaboration to foster low-carbon and climate-resilient urban development? We’re expecting to see a dynamic discussion on 5 December when business and city representatives get together to explore some of the most exciting developments in infrastructure; transportation & mobility; energy, water and waste management, buildings; information and communication technologies, and financing models. Speakers include Bernhard Schwager, Head Sustainability, Bosch, Ani Dasgupta, Global Director, WRI Ross Center for Sustainable Cities, World Resources Institute and Lauren Sorkin, 100 Resilient Cities Platform, The Rockefeller Foundation. We don’t need a crystal ball to predict that the effects of climate change will increase risks to businesses, infrastructure, assets and economies. In partnership with Climate Policy Initiative this event will bring together public and private sector experts to discuss climate risk management, raise awareness of how best to involve the private sector in responding to risks and explore ways to scale up finance for climate resilience in private operations. An opportunity for sharing experiences, the event will feature Valerie Smith, Director and Head of Corporate Sustainability at Citi Group and Julia Kochetygova, Senior Director, S&P Dow Jones Indices and is scheduled to take place at Le Bourget on 7 December. ICC warns that companies not already carbon constrained will need to prepare themselves for carbon legislation in the short to medium term, and a low-carbon economy in the long run. But what feasible options are there for integrating carbon market instruments in a 2015 climate change agreement? Representatives from business, UN, government and other stakeholder groups will identify basic principles and factors for governments and policymakers to help ensure that carbon pricing instruments, such as emissions trading schemes and taxes on carbon emissions, not only drive emission reductions effectively but do so in a way that incurs the least possible economic cost…. making this an event not to be missed!